This post will be a ramble, so apologies in advance. I'll start off by saying: Yes, this story will scare the hell out of you. Read what you can, but read the author's bio, at least. Side note: The author discusses in this Huffington Post article why he redid the story for the anniversary. When he narrated the audio the first time years ago, he was appalled with certain sections. Reading it out loud gave him a fresh perspective on how dialogue should be written and what the story was originally missing. When people think of the title, they only remember the film, and the possessed young girl. Maybe pea soup. Right? One tends to forget the story is called The Exorcist, so it's actually the tale of one man fighting the evil demon who picks a young girl to reside in. Is it any indication of my confidence level that I waited until my husband was around before I even pressed the button to download the audio of The Exorcist, the 40th Anniversary Edition read by the author William Peter Blatty? Of course it is. I love scary, but I am no fool when it comes to certain stories, and this one absolutely terrifies me. A couple weeks ago, my husband and I drove from Virginia Beach to Boston to visit his family. That's eleven hours of driving, my friends, so I knew it was time for a good selection. With Halloween around the corner and a trip up the East Coast shoreline, it seemed just right to have a fright-fest audio that would satisfy my need for all things scary and would also keep my husband's attention. When the music from the movie started up, we were driving along a stretch of Route 13 that cuts through the Virginia peninsula into Maryland and it.was.dark. I left it all up to my husband to drive since I honestly don't think I could have listened and driven a car at the same time. Without question, this audiobook is EXCELLENT. The story is incredible, the writing engaging, and the narration is perfect. Rarely can an author execute their own work effectively so it was a pleasant (and frightening) surprise when William Peter Blatty began the story and I immediately felt the hairs on the back of my next stand up. 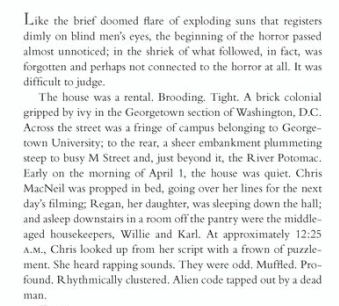 The author's gravelly voice eerily narrated the events we all know: Chris MacNeil, American actress and single mother to twelve-year-old Regan, live in a rented house in Georgetown. Shortly after moving in, Regan begins to exhibit behavior and is medically diagnosed from everything from puberty to potential brain tumors. As events progress quickly, and although Chris is an atheist, she comes to the conclusion that Regan really may be possessed. Searching for help, she meets with Father Karras, a Jesuit priest at Georgetown University. Struggling with his own faith after his mother passes away, he takes on the responsibility of investigating whether or not Regan truly is possessed. Valid proof is required for the Catholic Church to approve an exorcism. Putting aside the obvious fear-inducing anticipation that comes with forty years of urban legend, history, and stories about the movie, The Exorcist is much more than just horror. Yes, there are incredibly shocking scenes that are so disturbing, I'm fairly confident in proclaiming that no Hollywood production company will ever dare to remake this film. After all, Linda Blair was only fourteen-years-old when she played the role of twelve-year-old Regan, and there is no way that this role will ever be played again by a young child. It won't be allowed, and I think I'm just fine with that. Many may think that a story like this wasn't written well, but that it gained notoriety because of the horror and the subject matter. 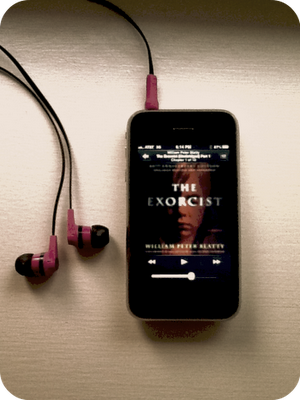 But anyone who has spent the time to read the book or listen to the audio can attest otherwise. This touches on all things that may strike fear in our hearts, but it is also purely representative of an honest story of one child and her single mother who is trying to pay the bills. Surrounded by good friends, Chris MacNeil becomes the central figure of the initial story, and Father Karras is key to the second half. His foundation of faith is spoiled by his mother's passing, which is a gritty, yet tender approach to the sadness he feels on losing her. Working with Chris' family to understand Regan and the possession is a frightening battle of good and evil and when Father Merrin arrives, the experienced exorcist, the battle truly begins. Without question, this story will scare the heck out of you. The scenes are sometimes so shocking that my husband and I were stunned, but the writing is impeccable and clearly relayed the events of terror that the young family experiences. While horror is the eventual result, the story is also meant to educate on what might happen if faith is tested. Whether or not you believe in God, this story will certainly give you pause. William Peter Blatty has documented (names changed to protect the innocent) the frightening story of one Jesuit priest battling evil to the point of ultimate sacrifice. I would not recommend listening to this book by yourself. Ever. It's just like the movie. So remember this contains incredibly graphic and disturbing s3xual scenes. If I've missed your review, let me know and I will link to it here. William Peter Blatty was born in New York in 1928 and is an American writer and filmmaker, most known for The Exorcist, in which he wrote the book and the screenplay for the film, winning an Academy Award. I don't usually point people to a Wikipedia page, but really, the nuggets of information of this man's life are incredible. His mother sold quince jelly on the streets of New York and even offered it to FDR when he was in town? He went to a Jesuit school in Brooklyn when Joe Paterno was the quarterback of the football team? He joined the Air Force after graduate school and (after a series of random blue-collar jobs) became the head of the Policy Branch of the USAF Psychological Warfare Division? 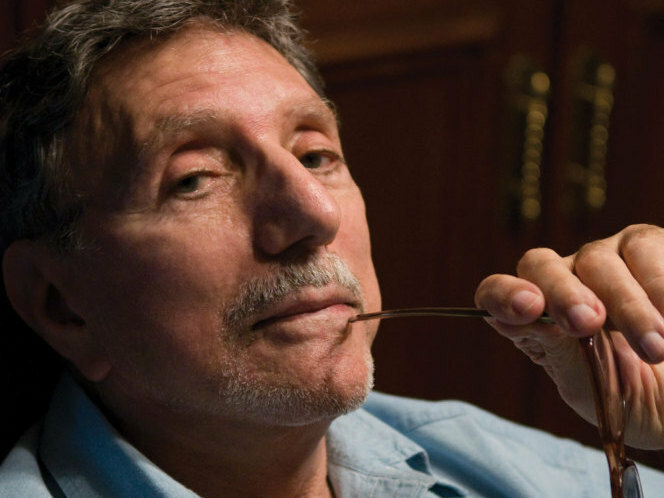 And then, after a series of books, he writes The Exorcist, that Blatty claims was initially a failure. Apparently, bookstores were shipping them back to the publisher, until "an extraordinary intervention of fate" occurred that he will not describe. This is another selection for Carl's RIP celebration. For other participants' reviews, please click here. You're a braver woman than I am. I've never even been able to watch the movie from start to finish. I saw parts of the movie, but am rather interested in listening to the book now that I have heard what you have had to say about it. It's so rare for a book to truly scare me, but I think this one would. It might be perfect for Halloween this year. I am glad that you had your hubby to listen with you. I might go the same route as well! The movie is watched by me every time Halloween comes around. For fun, check out this post that I just caught this morning. Oh my -- I absolutely think I need to get this on audiobook -- you make it sound so deliciously scary!! We LOVE this movie in our house, being the sick and twisted folk that we are. I need to find this on audio. I'm going to the library right now to see if they have it. GAH! They don't. Well poop. Anyway, I guess maybe I'll have to actually read it. 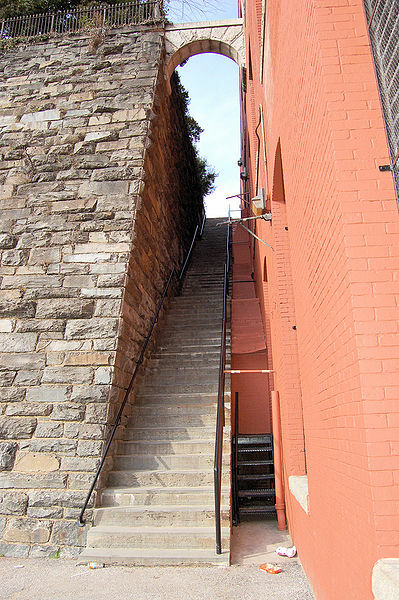 I've seen the stairs by the way! Such a highlight! Ha! I've never read (nor listened) to this! I need to remedy that right away! Just put a hold on the audio at my library, yay! That is one creepy, scary movie! Like the stairs photo. You might also like his novel "Legion" from 1983; it's quite good. I am so going to download this right now. I read it years ago and was scared outta my wits ... and narrated by William Peter Blatty ... can't wait. brrrr! the movie still gives me the creeps. the book sounds incredibly scary and intriguing though! Not this year, maybe next. I have never seen the movie. I don't care how good it is, I'm not doing it. I always forget this was a book. I will certainly read this one eventually. The movie still scares the crap out of me every time I watch it.